It's easy to pick beautiful blooms from the grocery store! You just have to know which flowers are healthy and which are waning. Everyone loves getting a special surprise delivery of fresh flowers. It's one of the best feelings there is! However, even as a florist, I must admit that it isn't realistic for people to have this experience every day. 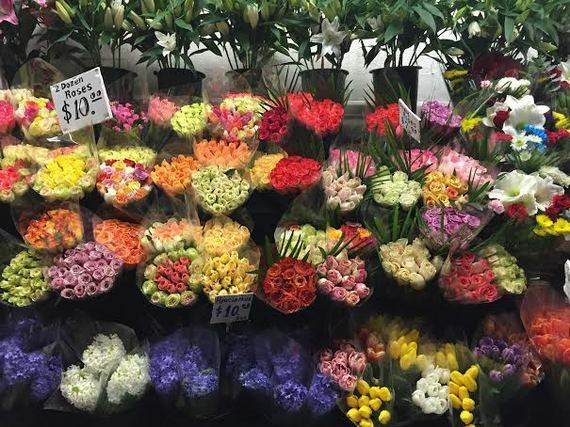 But, just because you're not always going to receive a gift delivery doesn't mean that you can't enjoy flowers yearlong; by going to the grocery store once a week, you can have gorgeous blooms surrounding you at all times. Ok, but you already knew that. And flowers from the grocery store are depressing -- they die faster and aren't as pretty. My theory is that grocery store flowers don't necessarily have to be less wonderful -- you just have to be your own best advocate by educating yourself on which flowers to choose and which flowers to skip. Armed with this knowledge, you too can enjoy delightful, florist-quality flowers in your home. 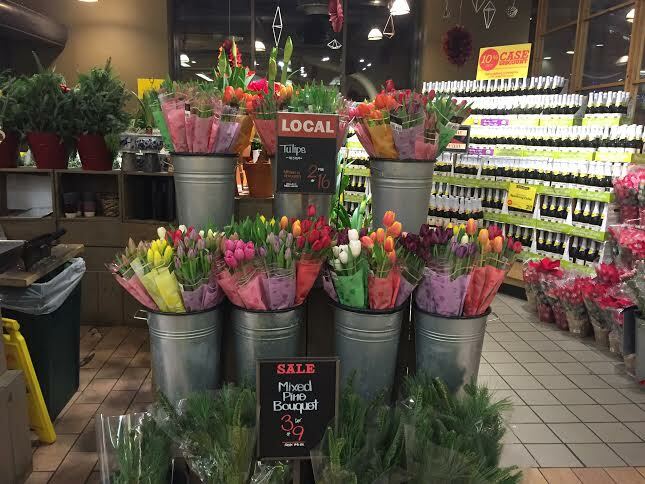 Beautiful local tulips at Whole Foods Chelsea. 1. Look at the foliage and stems. Don't just look at the flower -- look at the leaves and the stems to make sure they're neither dry and withered nor mushy and slimy. Green, solid stems and foliage make for a good, healthy flower. 2. Look for flowers on the "break." Although it would be tempting to pick out the biggest and most brightly opened flowers, it is best to choose blooms that are neither too opened, nor too closed. Blooms that are too opened are already at their peak and will have a shorter shelf life, and blooms that are too closed run the risk of not opening at all. 3. Pick seasonally. Lots of grocery stores and supermarkets tend to carry flowers that are locally grown in the current season. Just like vegetables and fresh fruits, the ones that are tastiest and sweetest are the ones in season. Click here for a great resource about flowers and their seasons. 4. Be confident! Be your own best advocate by embracing your right to examine the flowers you're about to purchase. Studiously examining flowers is best practice and something that any florist would do at the market. Just consider these tips, practice good flower maintenance at home, and you'll do fine! Good luck and do not hesitate to contact your local florist for any assistance. They will be more than happy to help. Looking to give your flowers better care once they're at home? Check out our article, "Keep Your Flowers Alive Longer! 4 Easy Steps" on HuffPost!